About sixteen inches long. Dark-brown upper parts, head and nape spotted with white. White face, dark brown throat. Tail, back and some wing feathers have white bars. Under parts sharp contrasting white and dark brown bars. 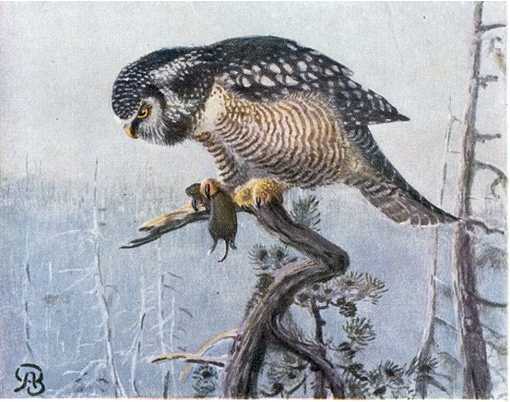 Owl like head on a hawk like body; folded wings fall short of its long tail. Species of the far north and circumpolar. Inhabits coniferous and mixed forests from northern Minnesota and Wisconsin, Alaska, Canada, Sweden, Norway, Finland, and Siberia to the Arctic. Occasionally a short distance migrant in winter to northern U.S. and Germany and France in Europe. Has hawk like habits, a day hunter, often perching in trees watching for prey. Eats grouse, rodents, and insects. Known to hover around hunters waiting for a chance to steal wounded game. Attracted to camp fires. Utters a shrill cry. 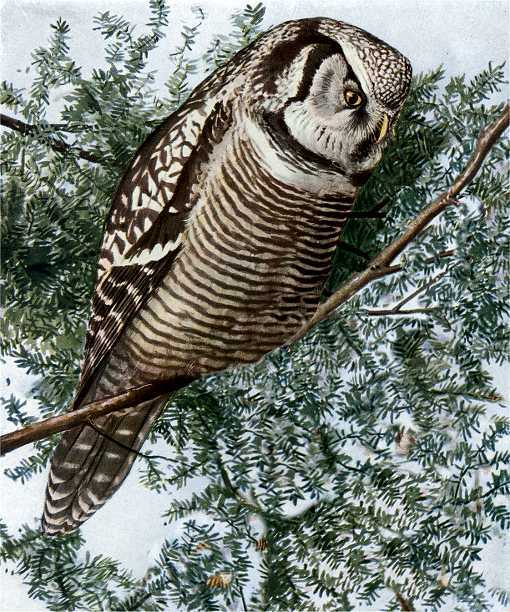 Hawk owls build nests of twigs and feathers in evergreen trees and tree hollows, or of a few rotten wood chips in natural and abandoned tree cavities, sometimes in old hawk nests. Bird boxes too. Females lay three to nine white glossy eggs, which hatch after less than one month of incubation and young leave the nest in about another month. The Hawk Owl Birdhouse (same as for the Red-headed Woodpecker and Golden-fronted Woodpecker) has a 6″ by 6″ floor, 14″ inside floor to ceiling, 2″ diameter entrance hole located 11″ above the floor and ventilation openings in the floor and under the roof. Assemble with corrosion resistant screws fit to pre-drilled countersunk pilot holes to reduce wood splittiing. Secure hinged roof with shutter hooks for easy access or a Side Opening Door may be a more convenient and safer alternative. Mount about ten feet high on a tree in a woodland edge or clearing. Place a bed of wood chips in the house, not saw dust which will retain moisture creating mold. About sixteen inches long. Dark-brown upper parts, head and nape spotted with white. White face, dark brown throat. Tail, back and some wing feathers have white bars. Under parts sharp contrasting white and dark brown bars. Owl like head on a hawk like body; folded wings fall short of its long tail. Species of the far north and circumpolar. Inhabits coniferous and mixed forests from northern Minnesota and Wisconsin, Alaska, Canada, Sweden, Norway, Finland, and Siberia to the Arctic. Occasionally a short distance migrant in winter to northern U.S. and Germany and France in Europe. Has hawk like habits, a day hunter, often perching in trees watching for prey. Eats grouse, rodents, and insects. Utters a shrill cry. Known to hover around hunters waiting for a chance to steal wounded game. Attracted to camp fires.